The first DHC-6 Twin Otter Series 400 turboprop ordered by Russia’s government-owned oil company Rosneft arrived at Krasnoyarsk on December 23. The second airframe of the type, manufactured by Viking Air, has completed acceptance procedures and will be ferried from Canada to Siberia in early 2016, a source has told Russian Aviation Insider. The aircraft are being accepted and ferried to Russia by Krasnoyarsk-based charter operator AeroGeo, which won Rosneft’s tender for these services in November 2015. RN-Aircraft, Rosneft’s corporate air operator, signed the deal with Viking Air in August. 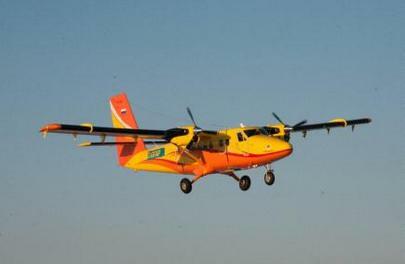 The contract is for the delivery of 10 19-seat Twin Otters by the end of 2016. The aircraft will be used to carry shift workers to Rosneft’s oil fields in Krasnoyarsk Region, and may begin operations in the first half of 2016. Rosneft has not yet decided on an operator for its DHC-6s. RN-Aircraft does not have an Air Operator Certificate, the source notes. Apart from AeroGeo, there is another candidate for the job, Surgut-based air carrier Skol, which has an affiliate structure in Krasnoyarsk. AeroGeo already has personnel trained on the type, as well as a maintenance center approved for servicing the Twin Otter’s Pratt & Whitney Canada РТ6А-34 engines. It was also the only participant in RN-Aircraft’s tenders for maintenance of the aircraft and storage of DHC-6 spares and tooling. The contracts, worth a total of $280,000, were signed in December this year. Skol, for its part, has only just started training its personnel to operate the type.